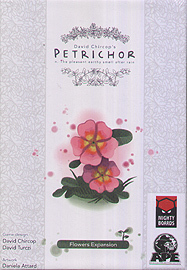 Petrichor: Flowers is an expansion to the Petrichor base game. It introduces a number of new gameplay elements including 3 new crop types, player powers, and the Forecast mini-expansion. It also allows you to play the Petrichor base game with up to 5 players. A copy of Petrichor is required to play.